Narrated by Chatty Cat find out how she makes new friends, goes on fresh adventures and discovers more about the fascinating world she inhabits. The book is interspersed with clever snippets of humour and with some references to social etiquette and introduces bullying and dementia in a subtle but positive way. I was reading it as soon as it was out of the package! I wasn't disappointed it is brilliant, immediately I'm there with Chatty Cat and her purr-felt friends on their adventures. Suzan Collins at her best sprinkled with magic. If you are owned by cats it's a must read! What is 11 - 5 ? It's a lovely tale that children and adults helping slow readers will enjoy. i would like to have this book please. A 'must' read for cat lovers everywhere. A book the whole family can enjoy! I don't read often but loved this book and nor do I like cats! A great read for my 10 year old daughter. lovely book. Purrfect little book. Nice gentle read with some bigger words to stretch younger readers. Great to read with your child and enjoy making special cat voices! I enjoyed this book a great deal. It's fun to see things from the cats point of view. This book will appeal to all ages. Hopefully encourage people to rescue rather than buy cats and how rewarding this is. An extremely entertaining book that engages children and takes them on a fantastic journey. Great cat story for children and adults alike which includes social etiquette and an introduction to dementia and bullying. 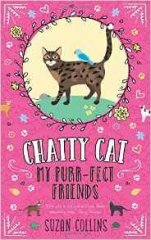 What a charming little book about Chatty Cat and friends and their adventures, children will love it, Cat lovers will love it and I love it. Brilliant work to your collection of Chatty Cat Books Suzan Collins. Really lovely book. Very entertaining. Brilliant, well written, heartfelt story.